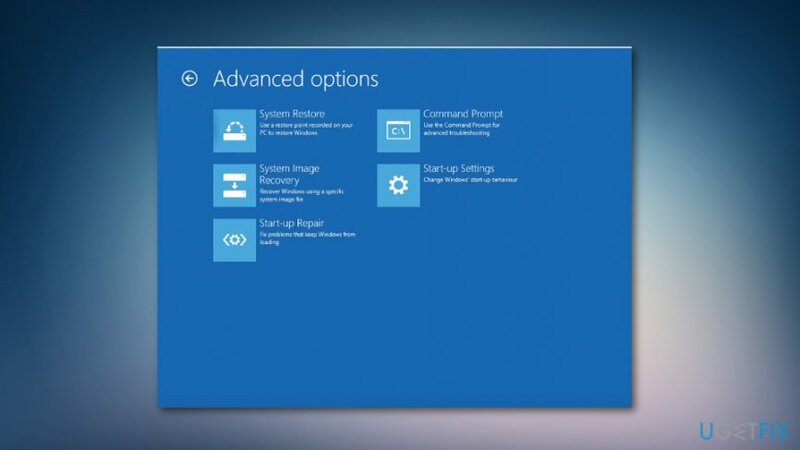 Home »	Fix » How to fix Windows 10 Anniversary Update Error 0x8007042B - 0x4000D? 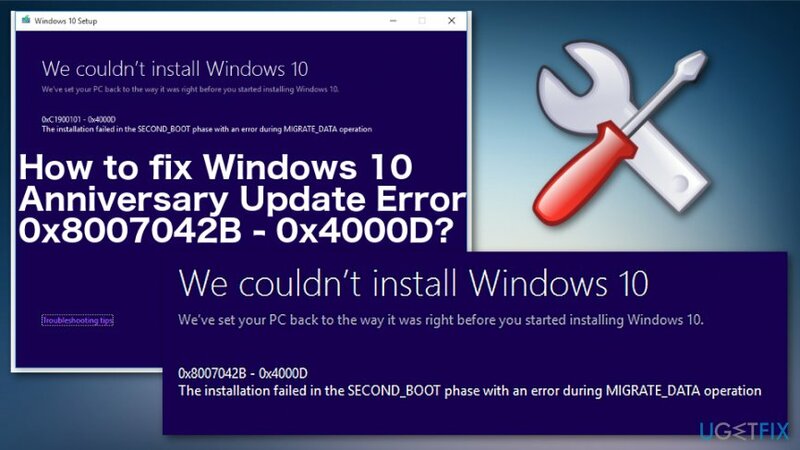 Issue: How to fix Windows 10 Anniversary Update Error 0x8007042B - 0x4000D? My PC got seriously messed up and I don’t know what I should do to fix it. I’m trying to install Windows 10 Anniversary Update, but during the second boot phase the process crashed with an error 0x8007042B – 0x4000D. Please help!! I have also noticed that the error message mentions the error in the migrate_data option. How to Fix Windows 10 Anniversary Update Error Code 0x8007042B – 0x4000D? Due to a diversity of errors, Windows 10 Anniversary Update often appears to be difficult to install or causing more issues on the system after the installation. Several people already reported the Anniversary Update installation failure due to 0x8007042B – 0x4000D error code. The 0x8007042B error usually pops up when the system is crashed due to the damage or corrupted files. When the machine freezes it may also affect the performance or some programs and files that are open at that moment. Unfortunately, virus attack or incomplete installation or uninstallation may cause these issues too. Another possible result of the 0x8007042B – 0x4000D error can be system corruption or improper functioning of the computer. PC becomes sluggish or throws an occasional Blue Screen Of Death, delivers additional error messages during the shutdown or startup of the system. 0x8007042B – 0x4000D BSOD error most frequently happens during the installation of the Anniversary Update. However, several people reported that it occurred when trying to update Windows 10 or upgrade it to the latest version. Unfortunately, but, at the moment of writing, there are no official fixes provided by Microsoft besides the newer updates available. These should be fixed and debugged. We believe that Microsoft engineers are working hard to solve these issues regarding the OS Updates, so keep track of the newest Windows 10 updates. We are pretty sure that 0x8007042B – 0x4000D error as well as other errors and bugs will be fixed in the nearest future. 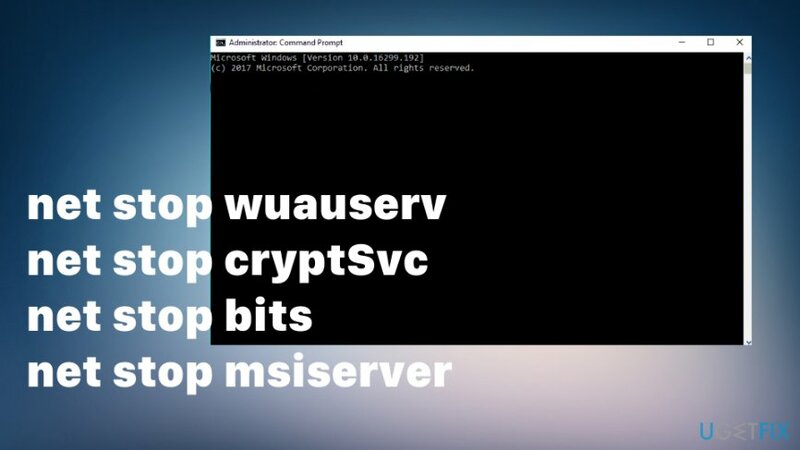 Nevertheless, we are going to provide several fixes that we've come up and which have been approved by Windows 10 users who have already been dealing with 0x8007042B – 0x4000D bug. Since the actual reason of 0x8007042B – 0x4000D issue hasn’t been identified, it’s quite difficult to provide any possible fixes. However, BSOD errors like this one are associated with the corrupted registry entries, damaged system/update files, missing Windows 10 updates, third-party software, antivirus, and similar issues on the previous Windows 10 version, which conflicts with the update and cause its crash. Once the system boots up, run a full scan with a professional utility to optimize the system. For this purpose,Reimage program is eligible. This repair tool has a database with Windows files that can recover needed processes without reinstalling the OS entirely. If a PC optimization did not help, then try to disable your anti-virus. For that, click Ctrl + Alt + Del to open Task Manager. Find the process of your anti-malware, right-click it, and select End Task. After that, locate its icon on the taskbar, right-click, and select Quit or Exit from the drop-down menu. Click on Win key + S, type msconfig in the search bar, and press Enter. When the System Configuration window shows up, click on Services tab, and place a tick alongside all Microsoft Services. When all services are marked, select Disable all. 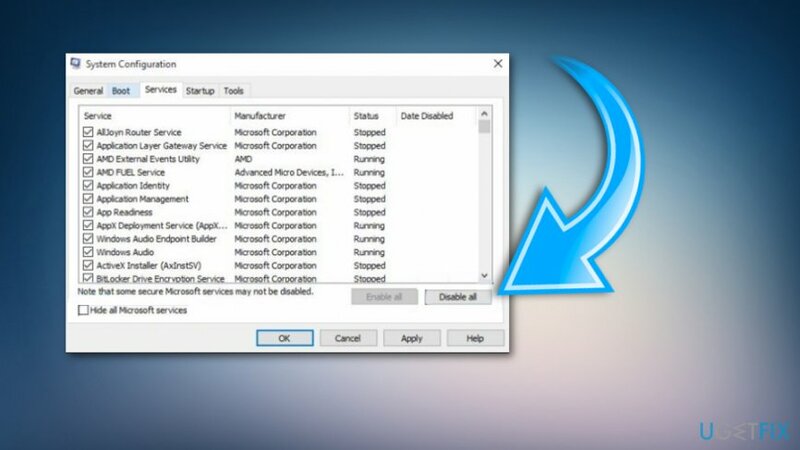 Select Startup and disable all programs that are set to boot along with Windows system automatically. Once done, restart your PC and try to install Windows 10, update or upgrade it depending on what you’ve been doing while the Blue Screen Error 0x8007042B – 0x4000D showed up. Press Win key and type Troubleshooting. Click on the search results. Then select Troubleshooting tab and click View all options (left corner at the top). After that, select Windows Update option and press Next. Go to Settings and Update and Security. View the update history and find the update that was successful. Then create a restore point and use System Restore. Choose the point with an earlier OS update and fix the 0x8007042B – 0x4000D error. Go to Restart menu options. Click Troubleshoot and go to Advanced options. ^ Gordon Kelly. Microsoft warns Windows 10 update has a serious problem. Forbes. Global media company. ^ Windows 10 Anniversary Update Error Code 0x8007042B-0x4000D. Answers. Microsoft community forum. ^ Liam Tung. New Windows 10 updates: These are the bugs Microsoft just fixed. ZDNet. Technology news, analysis and comments.